This week's Daily Record column is entitled "The Internet Revolution--Part 3." (This is part 3 of a series of articles in which I discuss the technologies and the historical context that led to the mass adoption of cloud computing. In the first article, our exploration began in 1995. Last week, in Part 2 of this series, we learned about how the technology changed, making the Internet revolution, and life as we now know it, possible. This week, we’ll examine how the rapid increase in the speed of broadband access paved the way for cloud computing). As we discussed last week, the speed of broadband access—one of the most important factors behind the rise of the Internet--has increased dramatically in recent years. Increased Internet bandwidth and speed has effectively erased the barriers that prevented us from fully realizing the potential of networked computers and the rapid exchange of data via the Internet. In other words, we’ve entered the next stage of the Internet and cloud computing is a finally a feasible alternative for businesses. In his book, “The Big Switch: Rewiring the World from Edison to Google” Nicholas Carr compares cloud computing to the electrical grid and suggest that just as businesses that once produced electricity in-house later outsourced electrical production to utility companies, so too will businesses ultimately outsource computing to the cloud. The network barrier has, in just the last few years, begun to collapse. Thanks to all the fiber-optic cable laid by communications companies during the dot.com boom—enough, according to one estimate, to circle the globe more than 11,000 times—Internet bandwidth has become abundant and abundantly cheap…Now that data can stream through the Internet at the speed of light, the full power of computers can finally be delivered to users from afar. Without this rapid increase in available Internet bandwidth, combined with the ever-increasing processing power and reduced costs for bandwidth and data storage, cloud computing and the advantages it offers businesses would not now be possible. The opening of the Internet floodgates that we’re now seeing is occurring, in large part, due to the operation of Moore’s Law. Moore’s Law, an important and pivotal theory, predicts that every two years the price of a unit of computer processing power will be reduced by half. Just as Moore’s Law dictates that a unit of computer processing power halves in price every two years, the price of bandwidth and storage is dropping even faster. What the Internet does is combine all three, compounding the price declines with a triple play of technology: processors, bandwidth and storage. In other words, we’re in the midst of a seismic shift. This conclusion is, I think, indisputable. The changes wrought by the Internet are broad and far reaching, affecting every aspect of our lives, from how we conduct business to how we connect and communicate with friends and family, how we obtain information, how we shop, and how we learn. This is an important shift—some might say it’s revolutionary. I would argue that this shift is on par with other fairly recent and significant events that fundamentally altered our culture, including the invention of the automobile, the creation of the US highway system, and the wide-scale adoption of air conditioning. Each of these events radically altered the landscape of our country, our cities, and our lives. At this point, there’s no turning back—these changes are here to stay and our lives will never be the same. Cloud computing promises to have this same effect upon our day-to-day lives and will no doubt be a force to be reckoned with in the coming years, as we’ll discuss next week, when we conclude this series by discussing another theory, Grove’s Law. We’ll then examine how recent events have made the large-scale availability of cloud computing a reality, effectively ushering in a new age of computing. 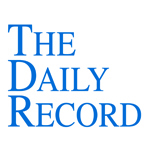 This week's Daily Record column is entitled "The Internet Revolution--Part 2." (Over the next month, I plan to discuss the technologies and the historical context that led to the mass adoption of cloud computing. Last week, our exploration began in 1995. This week, in Part 2 of this series, we’ll learn about how the technology changed, making the Internet revolution, and life as we now know it, possible). The Internet was a clunky beast back in 1995. By today’s standards, the dial-up connections were horribly unreliable and were slower than molasses. Anyone who had access to the Internet at the time no doubt recalls staring at a blank screen for minutes at a time while listening to the familiar, raucous sound of the dial-up modem attempting to connect to the network. Connection speeds and data transfers via the Internet were painfully slow because today’s technological groundwork for the information highway had not yet been laid. But since that time, Internet-based technologies have drastically changed our world. From 1995 until now, a number of important events occurred that made the Internet as we now know it possible. And, with these changes came the increased Internet and processing speeds that make cloud-based computing a feasible alternative. However, it wasn’t always this way. It was in1995 that things began to change, in part because the commercial possibilities of the Web became apparent. As with many other phenomena, commercialization was one of the driving forces behind change, in this case, the reorganization of the Internet. At the end of 1993, less than 5 percent of sites were in the .com domain…(A)s the profit-making potential of the new medium became clear, businesses rushed in and commercial sites quickly came to dominate the network. By the end of 1995, half of all sites bore .com addresses, and by mid-1996 commercial sites represented nearly 70 percent of the total. The next 5 years brought forth remarkable changes, due in large part to the forces behind the dot.com boom. In his ground-breaking work, “The World is Flat: A Brief History of the Twenty-first Century,” Thomas Friedman posits that the tipping point occurred sometime around the year 2000, when 10 “flattening” forces converged. According to Friedman, the interaction of these 10 forces—the fall of the Berlin Wall, the rise of the PC, Netscape, work flow, outsourcing, offshoring, uploading, insourcing, supply chaining, in-forming (Internet search), and the Steroids (digital, mobile, personal and virtual)—resulted in a new world order, moving us from Globalization 2.0 to 3.0. In other words, it’s a whole new ball game now that we’ve now entered Globalization 3.0. The rapid convergence of the ten flatteners has changed the way that we do business and there’s no turning back. The activities that we engage in every day using the Internet would not be possible but for the widespread availability of broadband access. Next week, we’ll continue to explore the many forces and technological changes behind this seismic shift. This week's Daily Record column is entitled "Proposed NC bar opinion limits cloud computing." Last May I discussed the North Carolina State Bar’s Proposed 2010 Formal Ethics Opinion 7, which was issued in response to a lawyer’s inquiry as to whether it was permissible for a firm to use Software as a Service (SaaS) products in its law practice. After reading the opinion, I concluded that it provided a broadly framed, elastic standard that permitted individual attorneys to make careful choices about the technologies that best fit their individual practices. The opinion also included a very useful list of suggested questions that lawyers were advised to ask cloud computing vendors prior to using their products. A few weeks ago, the Bar issued a revised opinion, Proposed 2011 Formal Ethics Opinion 6 (available online at http://www.ncbar.gov/ethics/propeth.asp), which replaced the Bar’s prior proposed opinion on this issue. I am disappointed with the new opinion. It’s overly broad and far too rigid, serving to severely limit North Carolina lawyers’ ability to use cloud computing products in their practices. The new proposed opinion answers this very broad question: “May a law firm use SaaS”? Note that is inquiry does not address the type of information that a lawyer seeks to store in the cloud, but rather, lumps confidential and non-confidential data together. However, the Committee then stated that in order to sufficiently exercise reasonable care when using any type of SaaS product, lawyers must take a number of steps. First, lawyers must ensure that an agreement is in place with the vendor that ensures that the confidentiality of client data will be protected. Second, the vendor agreement must limit the geographical region in which the data will be stored. Third, lawyers must be able to retrieve their data in a readable format, on demand. Fourth, the lawyer’s employees must receive training on certain security issues such as strong password creation. While I agree that all of these measures are important to take into consideration when choosing a cloud computing service, I object that the Committee made these steps mandatory. The Committee fails to recognize that the cloud computing needs of every law firm will differ greatly, as will each firm’s implementation considerations. One problem with the Committee’s mandate is that it makes a number of potentially false assumptions in regard to lawyers’ use of cloud computing products. These assumptions include, but are not limited to, the following: that lawyers will store only confidential data in the cloud, that all lawyers’ employees will necessarily have access to data stored in the cloud, and that lawyers will not maintain local back ups of their data on their own servers or elsewhere. For example, some attorneys may choose to utilize the cloud for the storage of non-confidential data, including legal forms, administrative forms, redacted memos of law for future reference, and excerpts from legal research. Others may choose to choose to test the cloud computing waters by using cloud computing services for tasks that don’t require the input of confidential information, such as billing or time tracking. For these lawyers, many of the mandatory requirements would be unnecessary and requiring them to implement these procedures is pointless and unnecessarily impedes their cloud computing choices. Likewise, if lawyers maintain local back ups of their data, the ability to extract readable data on demand may be an unnecessary requirement. Similarly, law firms with local back ups may not be concerned with the very remote possibility that their data will be “held hostage” due to the operation of the European Union’s Data Protections laws. The bottom line is that I disagree with the imposition of any mandatory requirements upon lawyers choosing to use cloud computing products. Instead, requiring lawyers to exercise reasonable care in choosing a provider and providing a list of security and privacy issues to take into consideration makes more sense. Doing so allows lawyers to choose a provider based upon their law firm’s needs and their unique situation. Here, the Committee’s most recent proposed opinion on cloud computing use in law firms establishes unnecessarily rigid standards that impede the ability of individual lawyers to determine the technologies that best fit their practice. Hopefully, the Committee will reconsider its position and will soon issue a revised opinion that offers more elastic standard for North Carolina lawyers. 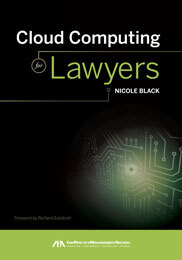 People have been asking me when my book about cloud computing for lawyers, which will be published by the American Bar Association, will be out. So, I figured I'd provide an update on the status. I'd hoped that it would be published by now, but, as was the case with the book that I co-authored with Carolyn Elefant, Social Media for Lawyers, nothing happens as quickly as you would hope when it comes to getting a book published! The book is written and we're just tweaking it a bit--deleting a few things, adding others. Peer reviewers have provided their feedback and it's very close to the final draft. I've also been reviewing proposed covers and have been working with the marketing division to create a marketing plan for the book. I'm particularly excited about the foreward, which was written by a very well known, world renowned legal technologist--you'll have to wait until the book comes out to learn who it is. I was honored that he agreed to write the foreward and it's a great addition to this book. So, hopefully, if all goes as planned, the book should be out by the middle of the summer, at the latest. I'm looking forward to it--I hope you are, too! If you own an Android phone, check out Sui Generis' newest sponsor, DroidLaw. As I explained in this recent Daily Record article, Droid Apps for Lawyers, DroidLaw is a free app that includes the full texts of the Federal Rules of Civil Procedure, Evidence, Appellate Procedure, Criminal Procedure, and Bankruptcy Procedure. Each set of rules is provided in a format that permits searching, bookmarking, copying, sharing and note taking. Other databases, including individual state's laws and United Supreme Court opinions, are available for an additional fee. DroidLaw is now compatible with Android tablets as well. If you have an Android device, it's an app worth exploring.